How can I apply merchant payments (transactions) to a deal? 1. Manually enter each transaction (payment, fees or discount) related to the merchant's funded deal. 2. Upload a spreadsheet with multiple transactions. 3. Integrate with one of MCA Suite's collectors to automatically pull daily remittance information and apply it to a funded deal. 1. 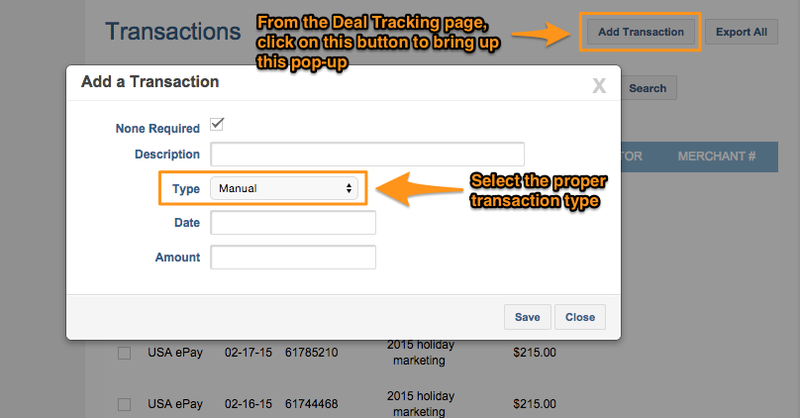 You can manually add transactions from the Deal Tracking page. You will need to click on "Add Transaction" which will bring up a pop up window. You will need to provide some details related to the transaction. If you've set up a Collector with a merchant number, you can associate the manual transaction to the merchant number and retrieval company. If you do not wish to form that association, simply select the "None Required" checkbox. You will also need to provide a brief description about the manual transaction you're adding. Examples could include: bounced check, received check from merchant, finder's fee, etc. a) Manual - this transaction type is treated as money that pays off the amount outstanding and is part of the amount repaid total (but has no effect on the expected payback amount). b) Fee - this transaction type adds to the amount outstanding and also increases the expected payback amount (but does NOT contribute to the amount repaid total). c) Discount - this transaction type reduces the amount outstanding and also decreases the expected payback amount (but does NOT contribute to the amount repaid total). The date and amount information is required and will be inserted in the "Transactions" section of the Deal Tracking page. 2. You can upload a spreadsheet with multiple transactions against a funded deal. To do so, you will need to provide Collector's information as well as the merchant number in the "Deal Tracking" page. The "Collector" textbox is a look-up against contact companies with "Collector" as a contact type. You will also need to provide the Merchant Number, which is generally assigned by the Collector. Using the "Collector" and "Merchant Number," MCA Suite will be able to apply transactions against a funded deal. A. Collector: This is the name of the Collector associated with the merchant deal (as explained above). B. Transaction Date: This is the transaction date. This information will be use to report key metrics. Transaction Date must fall between once month before funded date on the deal and the present date of upload (i.e., future transactions cannot be uploaded). C. Merchant Number: This is the unique number provided by the Collector (either credit card process or lockbox provider). It must correctly match with the Collector name you select/enter on the Collection Method section of the Deal Tracking page for this deal. D. Merchant Name: Name of the Merchant listed on the Company page. This is a required entry, although the import cares more about the merchant number and Collector company matching, than the Merchant name being correct. You could have a small typo in the Merchant name and as long as the merchant number and Collector company corresponded correctly, the transactions should still upload correctly. E. Amount: This is the amount the Funder has received from the Merchant which will be applied as a repayment to the funded deal. F. Description: In case you want to add a memo or description to go along with the transaction, you can enter that in this column, although it is optional (not a required column entry). The description you enter will appear in the "Description" column of the Transactions table on the Deal Tracking page for this deal. With the formated file, go to the ADMINISTRATION > IMPORT > TRANSACTIONS tab and select the (csv) file to be uploaded. You will need to click on the "UPLOAD" button to have MCA Suite validate the csv file is in its proper format. There are also other upload validation rules where MCA Suite checks the transaction date against the deal's funded date to make sure transactions are not before the funded date. Once the file has been uploaded and passes the validation rules, you will see a "Upload Success" message. You will need to press the "Process" button to apply the transactions in the csv file to the funded deals. MCA Suite will inform you of the number of lines it has processed on the spreadsheet. If any lines have an error, MCA Suite will skip over those lines and continue to process the rest of the import. We will list out for you the lines that errored and display an error message to let you know what caused the problem with a specific line. Once the csv has been successfully processed and transactions have been applied to all funded deals, you can go to an individual deal to validate that the transactions have been applied. 3. The third way to apply transactions to a funded deal is by integrating your MCA Suite account with a payment gateway. For more details, please refer to the payment gateway setup article.